New Zealand is full of picturesque places to wander, and most people say it is best to explore New Zealand via the road. Home to some of most beautiful scenery you’ll ever witness, New Zealand is a must-see for travellers and adventurers from around the globe. When you drive within this beautiful country, you will be lucky enough to experience incredible beaches, lush rainforests and snowy peaks all within a single day. The max speed limit you will mostly encounter is 100 kilometres per hour and most roads will have one lane going in each direction. On roads with more traffic, there are extra lanes that will allow others to pass you. There are many areas that will allow for you to safely pull over to the side, enjoy the views, and give way for cars behind you to pass. 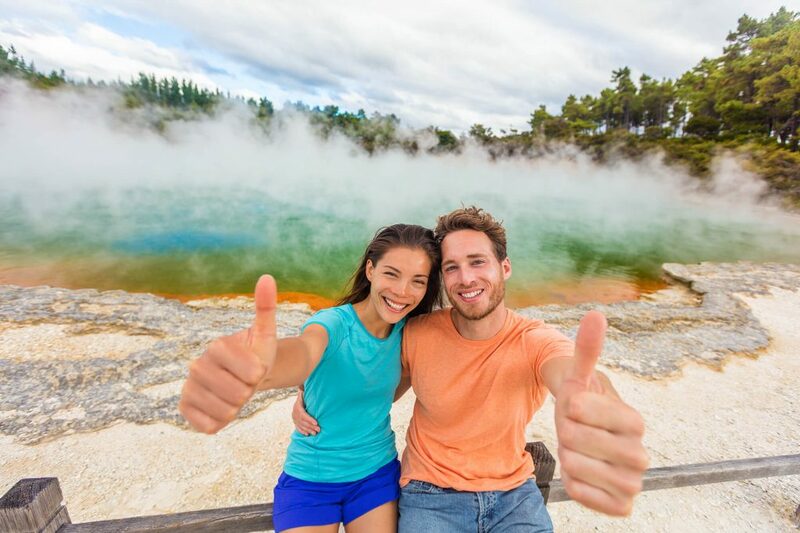 On this route you can explore some of New Zealand’s volcanic sites, such as the Lake Taupo volcanic crater. You will also be able to discover local wines by visiting the wine regions of Martinborough. Napier is an art-deco enthusiast’s dream. Full of retro art-deco styled architecture, Napier is a fantastic beginning to coincide with the isolation and remote natural beauty you’ll find within the rest of the East Cape. In Gisborne, you will be able to go for some wine-tastings at their selection of local vineyards and further along the trip, be lucky to find various small towns to explore. This coastal drive allows you to explore a variety of New Zealand’s picturesque beaches such as Coromandel, Matarangi, Whitianga, Pauanui, Whangamata and Waihi. If you’re a beach lover and love to chase sunsets, this is the road trip for you. Start this road trip in the small seaside town of Greymouth, and then move towards the south, along the rugged coastline. During this route you will have the opportunity to visit the breathtaking Fox and Franz Josef glaciers, and be humbled at its incredible beauty and size. Nearing the end, you will be able to discover the Southern Alps before arriving in Queenstown, where the most adventurous of travellers can go skydiving and/or bungee jumping. On this trip, there will be any opportunities to wine and dine in some of the nation’s finest food establishments. Kaikoura is the place to be for seafood lovers and you must not forget to try the South Island’s crayfish. And the culinary delights you enjoy will be complemented by incredible cliffs and unforgettable natural sights all around. This road trip is a windy one! The scenic drive between Queenstown to Te Anau – the entrance to Fiordland National Park – is known as ‘The Devil’s Staircase’, because of how torturous and strong the winds can get in this area. On this route, you will be in awe of all the natural beauty surrounding the lake and if you’re into nature hikes, this is the road trip you cannot miss! With a population of only 4.7 million people, you’ll be able to see why nature has been well preserved in New Zealand. Year after year, the tourism numbers to New Zealand increase, as more people wish to explore the natural wanders of this country, but the best way to experience all that New Zealand has to offer is by road and we encourage you to add these routes to your trip so that you can experience epic, unforgettable views and breathtaking scenery.